The cool new Smeg Mini Fridge is a modern take on retro '50s refrigerator design. 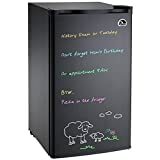 Normally, a typical mini fridge doesn't take your breath away in the looks department, but this one is simply, dare I say, beautiful. 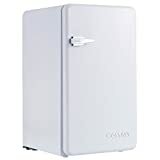 Besides stunning great looks on the outside, this mini fridge has 1.5 cu ft. capacity, LED lighting, 2 adjustable shelves, door storage, and a freezer compartment on the inside. Available in an assortment of colors too. Perfect for chilling old-fashioned sodas next to your jukebox, in your garage next to your restored '57 Chevy, or in your wet bar down in the old rec room.